Read using our free app! Let the Spirit live inside you! Are you hungry for an encounter with Jesus? Do you want to make an impact on the world? 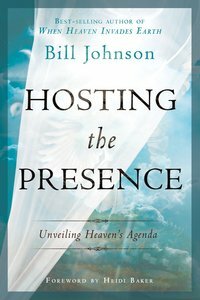 In this power-packed book, Bill Johnson discusses how you can be a person who hosts the Presence of God. Though all believers obviously have the Spirit of God within them, there is more that enables you to be so full that you overflow His Spirit into your world. Take a journey and meet many great prophets and kings from the Old Testament who were known as people of the Presence-people who, in Johnson's words, "God wanted to be with." In this succinct and powerful book, Johnson encourages you toward a pursuit of the Presence of God above all else. How to pay attention to the Holy Spirit and respond to Him. How the Holy Spirit manifests Himself. Biblical figures who were hungry for more of God's Spirit and learned to host Him. Stories of Presence-filled revivalists and personal encounters with the Presence! Bill Johnson writes: "We are enabled to partner with the Kingdom of Heaven and see it released here on earth! The Presence of God within us will bring reformation to the world around us-encountering a loving God!" Host more of Him today! Johnson is a fifth-generation pastor with a rich heritage in the Holy Spirit. Together Bill and his wife serve a growing number of churches that have partnered for revival. Bill and Beni Johnson are the senior pastors of Bethel Church, Redding, California. Customer Reviews For "Hosting the Presence"
The book is widely recommended for all believers who is thirst and hungry for more of His present. Bill clearly guide readers step by step into this. Overall it's a very challenging book to read and practise . I believe you will learn a lot from bill's experience in close encounters and hosting His present in every second of your life. Pastor Bill Johnson has the ability to explicate the Word of God in a profound yet simple manner. A worthy teaching series for every believer. Another Excellent book from Bill Johnson. Its hard not to at least check out any book he writes. If you want more of God and be a world changer this a great addition to your library. I am sure this will become a classic. Biblically correct and in line with my experiences as a Christian for over 40 years. Wonderful book that teaches people to become more aware of the Holy Spirit, and how to connect to Gods prescence. Discover how to get the best eBook reading experience on your phone, tablet, PC, Mac, or dedicated eReader.